Pamper your pooch with a cool dog bandana from Calder Screen Print! We have a wide range of colours of dog bandanas always in stock and ready to print. Our dog bandanas are made from 100% machine washable cotton. Simply slip the dog bandana onto your dog’s collar with no need for buckles or fastenings. 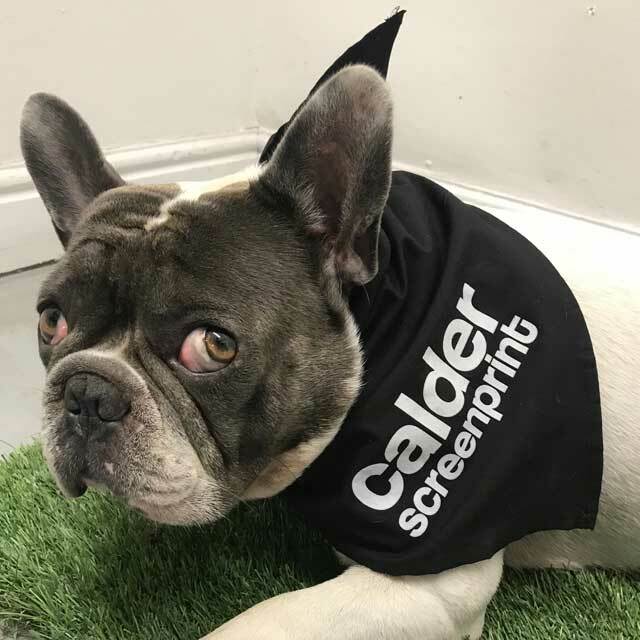 Calder Screen Print’s dog bandanas make the perfect gift for any dog, or fantastic promotional idea – imagine your dog in the park wearing one of these fabulous dog bandanas! At Calder Screen Print we like to make it easy to order your dog bandana. Simply call us on 01422 377799 and we’ll talk to you in plain English on how to order your printed dog bandanas.